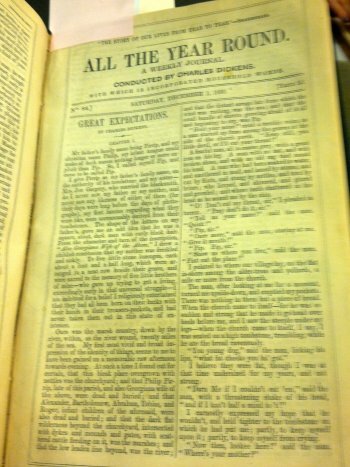 Shakespeare’s quote, “The story of our lives, from year to year,” taken from Othello, inspired the title of All the Year Round (1859-1895), a Victorian serial publication published by Charles Dickens. The pages are divided into two longitudinal sections, and an array of horizontal lines divide the stories within those columns. Inside Pius library lie volumes three and four, containing publications from April 14 through October 6, 1860, and those from October 13 through March 23, 1861. Historically, All the Year Round has been home to the literary work of many authors. 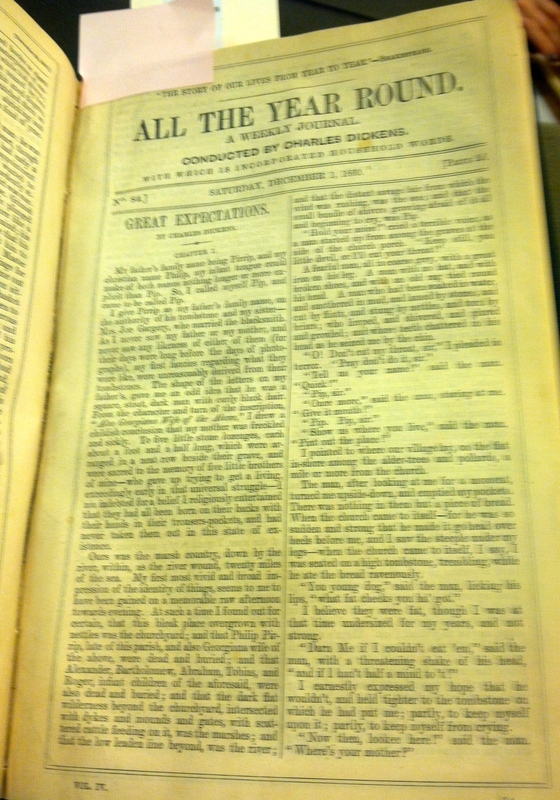 In these specific editions lies Great Expectations, a novel that emphasizes the importance of appearances, the development of moral standards, and the demoralizing qualities of wealth. Interestingly, the protagonist of Great Expectations resembles Dickens himself. Dickens, too, was born into poverty, and spent part of his childhood working in a boot-blacking factory. Later, he began freelance reporting, where he developed his writing skills. The hardships of Dickens’s childhood are reflected in the fluctuation of tone, between cheerful and cynical, exhibited in his writing style. Dickens's writing was loved by and available to many. 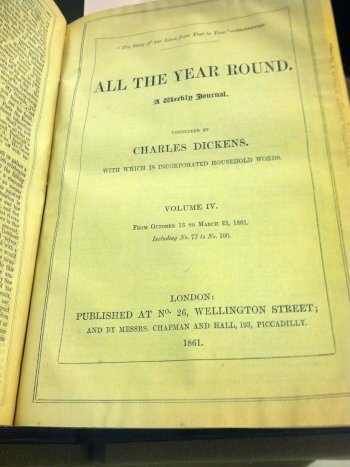 All the Year Round was produced in weekly installments, spreading the cost of a novel over a year and a half, allowing the middle and lower classes the chance to enjoy literary works. With changes in population density and social structure due to the Industrial Revolution, it followed that serialization of literature, a process that makes literature readily available all, would become wildly successful. All the Year Round embodies the cultural, social, and economic changes of the Victorian era, and truly does tell the story of Victorian times, from year to year.